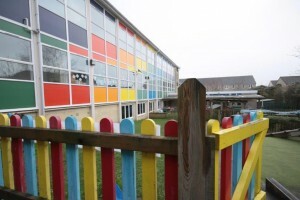 The site of the current Nailsworth CofE Primary School was a secondary school (Highwood School) until 1991, which means that we have an impressive range of facilities: a purpose-built gymnasium, large hall with stage, catering kitchen, spacious playground with play equipment, wildlife garden, children’s kitchen, parking for parents and large playing field and Multi-Use Games Area. Our children have fantastic opportunities to take part in all sorts of activities onsite. Many parents say that the facilities here are a main reason why they chose Nailsworth CofE Primary School. Last year, we were extremely luck to benefit from this impressive new cookery room. 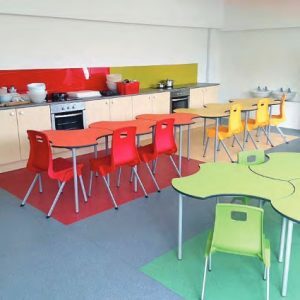 Using exciting colours and ergonomic layout, this cookery room now allows us to offer ALL years in the school cookery lessons with the Star Anise chefs and an after school cookery club. I don’t think the chefs are ready just yet though to share their culinary secrets on making the school meals taste so delicious! Our extensive sports facilities enable us to offer a wide range of sporting activities both indoor and outdoor. 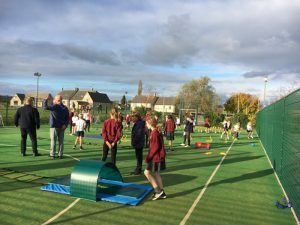 We have hard surface netball/hockey courts and a very large playing field, plus, in October 2018, we were proud to open our wonderful MUGA (Multi-Use Games Area). Indoors, we have a fully equipped gym with climbing apparatus, vaults, mats, trampolines, table tennis tables, benches and courts that are large enough to host full size basketball games. We have recently refurbished an annex of the gym as a fitness suite, housing 15 rowing machines. Perhaps one of the most impressive things about Nailsworth CofE Primary School (and one regularly commented on by new parents) is how spacious and bright ALL of the classrooms in the school are. We are very lucky to have rooms of this size and the children can enjoy different areas of the classroom for a variety of activities. Over the past 5 years we have installed new windows in all seven classrooms plus many other areas of the building. We have upgraded the children’s changing rooms and now have a fitness room with 15 rowing machines. In addition, we have converted a large store room into a purpose built Design Technology room. We have successfully upgraded the school stage with new sound and lighting systems plus a new maple stage flooring. Our current entrance is being adapted to support greater ease of access with a new ramp and automatic entrance. We also have a new portable lift to support easier access through the Hall to the classrooms. Developing our large building into a state of the art facility is an ongoing process. Out of school hours, Nailsworth CofE Primary School becomes Nailsworth Recreation Centre providing fantastic facilities for sports, performances and other events. To find out more about hiring our facilities, click here.